Environmental concerns can touch virtually any company today. Clients of the firm include Southwest Airlines, Texas Instruments, and Essilor of America. Law, Science, Reasonsm – this phrase describes the firm’s underlying philosophy. Our practice is founded on more than a narrow view of the law. Rather, our analysis incorporates our experience in science, law and sound business practices to ensure that clients receive well-rounded, effective solutions to their environmental needs. 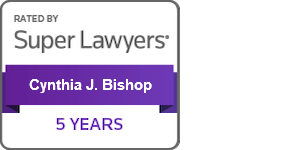 With over 20 years experience as an attorney and 7 years prior experience as an engineer, Cynthia Bishop provides well-reasoned, practical solutions. She listens to her clients to meet not only their legal needs but their business needs, crafting practical yet creative, cost-effective and responsive solutions.